More homeowners are choosing high quality materials for their bathroom countertops. 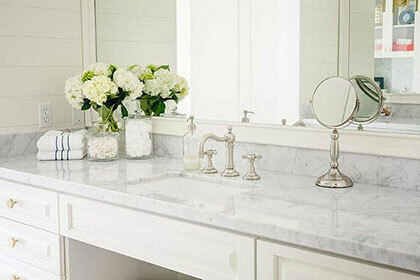 Some of the most popular materials for bathroom countertops include granite, marble and quartz. There are pros and cons to each type of material, so research carefully before making a final selection. The countertops in your bathroom don't take as much daily beating and therefore don't need to be quite as durable as kitchen surfaces. Whereas you can't use cultured marble in a kitchen because it's not durable enough, it works wonderfully in a bathroom and enhances the luxury of the space. Bathroom countertops can't be porous or delicate either. Granite – Featured in high-end bathrooms for years, granite now appears in a variety of home styles. It represents a considerable investment, but it's durable and possesses unparalleled beauty. Granite requires sealing every 6-12 months and careful maintenance. Quartz – This material mimics the appearance of granite, marble, or limestone, but has increased resistance to stains and scratches. Quartz bathroom countertops are actually a mixture of at least 90% natural quartz and granite powder with the remaining 10% made up of polyester resins. Sealing isn't required for quartz and it's easy to clean. Marble – Marble is a beautiful material that gains more character as it ages and acquires a patina effect. However, marble requires sealing and careful cleaning, so it can be a challenging material to keep clean in bathroom countertops. JSC Stone has all the information, expertise, and materials required for improving your bathroom countertops.